Start off your visit on the 22nd (Tue): get a dose of the wild on a nature and wildlife tour, kick back and relax at Doctor's Cave Beach, and then make a trip to Hip Strip. 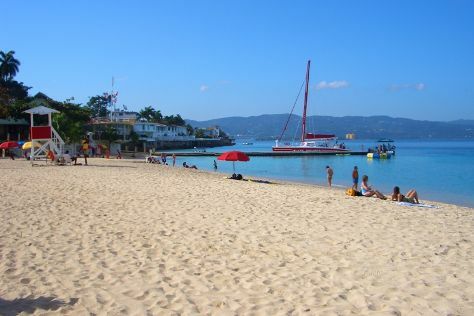 To find ratings, more things to do, photos, and tourist information, read our Montego Bay tour planner. Use the Route module to find travel options from your starting location to Montego Bay. In November, plan for daily highs up to 36°C, and evening lows to 28°C. Wrap up your sightseeing on the 23rd (Wed) early enough to drive to Negril. Step off the beaten path and head to Bloody Bay and Spas & Wellness. The adventure continues: enjoy the sand and surf at Seven Mile Beach, tour the pleasant surroundings at Half Moon Beach, explore the fascinating underground world of Blue Hole Mineral Spring, and fulfill a lifelong dream with a swim-with-the-dolphins experience. To see photos, other places to visit, ratings, and tourist information, go to the Negril itinerary planner. Traveling by car from Montego Bay to Negril takes 1.5 hours. Alternatively, you can drive; or take a bus. In November in Negril, expect temperatures between 36°C during the day and 28°C at night. Finish up your sightseeing early on the 27th (Sun) so you can go by car back home.